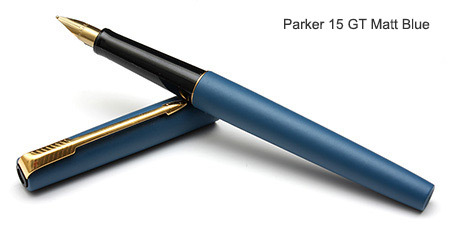 The Parker 15 began life in 1979 and was first produced in France as the Parker Mixy, designed from the outset as a cheaper "school" pen. The early French models had a broad stylised clip with an engraved large 6 feathered arrow. In 1980 the UK and USA factories began producing the pen but with a less stylised clip which was designated as the Parker 15. The French Mixy version was discontinued in 1981 in favour of the Parker 15 version. Basic variations were the Special CT which came with a steel cap and steel nib with chrome trims and the slightly more up market GT which came as matt epoxy resin over a steel body with gold plated nib and trim. 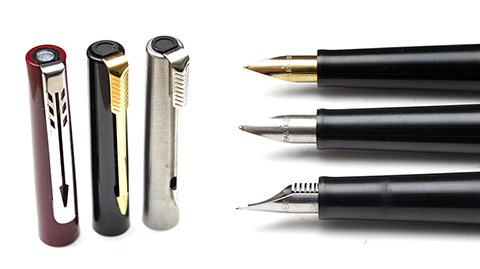 A steel flighter version was also released as well as some glossy lacquer over brass GT pens. 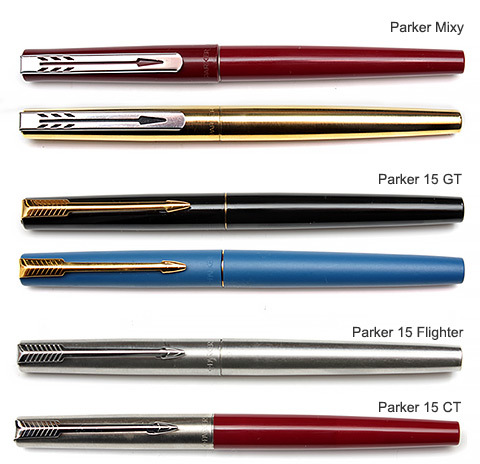 The Parker 15 is identified by its small size, only 120mm long capped compared to, for example, a Parker 45 Flighter at 135mm as well as the slim fluted shell section leading down to the long slim nib. The cap clip is held in place by a distinctive plastic circular dimpled clip holder with a cut away to allow the clip to exit. In 2000 the Parker 15 fountain pen was merged with the long lived Parker "Jotter" and are still available as Parker Jotter Fountain Pens. Even though the Parker 15 is designed as a cheaper "school" pen it can be quite surprising, particularly the GT versions with the metal barrels and caps which give the pen an element of quality. Like the Parker 45 the 15 makes a good place to start a collection for collectors on a budget, although the original French Mixy pens are very collectable and command much higher prices.